← BLUE MOON – FEB 11 2017- All governments are DEAD & CLONED! (Justin Gardner) President Trump appears to be swiftly bending knee to the militarized foreign policy establishment, as he intends to approve weapons packages for Saudi Arabia and Bahrain. The two Middle East dictatorships – with a long history of human rights abuses and violent crackdowns on dissent – are crucial to the strategy of U.S. military hegemony and the profits of weapons makers. According to The Washington Times, U.S. officials and congressional sources confirmed $300 million worth of precision-guided missile technology is destined for Saudi Arabia, while Bahrain will get a multibillion-dollar F-16 deal. All is ready to go, awaiting clearance from the Trump administration. Bahrain, a small but oil-rich country strategically located in the Persian Gulf, is home to the U.S. 5th fleet and Central Command. As we reported in Dec. 2015, Bahraini security forces have cooperated with ISIS, and several ISIS recruits have come directly from Bahrain’s military. Bahrain’s Sunni monarchy has a history of brutally suppressing pro-democracy movements, using torture and other human rights violations to maintain power. In 2011, Saudi Arabia sent troops into Bahrain to help squash the Shia Muslim revolt. The suppression of Shiite minorities is the common denominator with Bahrain and Saudi Arabia. The Saudi kingdom is a hotbed of support for ISIS, which has to do with the fact that the state-sanctioned religious clergy teaches a radical form of Islam known as Wahhabism. The Saudi monarchy is the number 1 beheader in the world — yes more than ISIS — racking up 100 public executions since January 2016, including 47 people in one day. Despite all of this, the U.S. has enlisted Saudi Arabia to carry out a proxy war in Yemen, where they have killed an untold number of civilians and bombed hospitals and schools. President Trump appears eager to continue and expand this partnership with the Sunni dictatorships, where Trump also happens to have business ties. The unifying goal with all three players is maintaining the dominance of Sunni Arab countries in the Middle East and countering the influence of Shiite-dominated Iran. 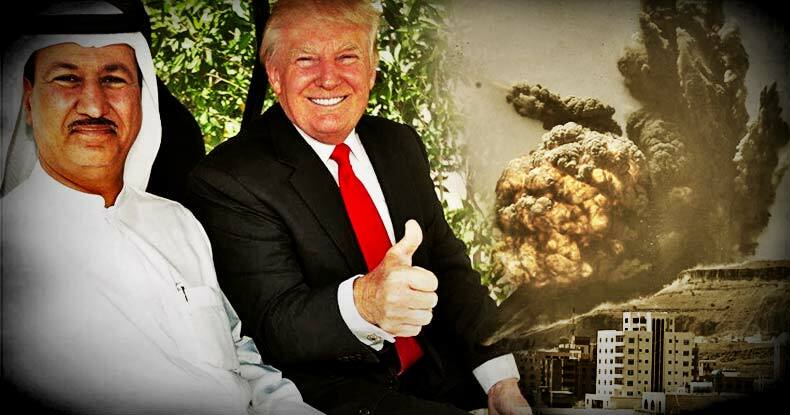 Team Trump has expressed a particular vehemence for Iran, with National Security Advisor Mike Flynn stating Iran is “on notice,” although no evidence of actual threats posed by Iran has been provided. It is widely assumed among Americans that Iran poses some kind of danger to the U.S., even though they haven’t attacked anyone in 200 years and have agreed to a historic nuclear deal with the five members of the U.N. Security Council. The unfounded hostility toward Iran demonstrates the effectiveness of the U.S. propaganda machine, which must always have a bogeyman to justify military hegemony in the Middle East. The claim that Iran is the biggest destabilizing force in the Middle East is absurd when we consider the decades of wars and interventions carried out by the U.S. in the interest of securing the flow of oil. There is significant bipartisan resistance in Congress to the weapons for Bahrain and Saudi Arabia, but that will likely be overcome as a renewed hostility toward Iran takes shape, and the purveyors of endless war see new opportunity with the Trump administration. Efforts to block sales have failed, though, as the military-industrial complex has spread its manufacturing facilities all over the U.S. in order to secure support from as many lawmakers as possible. The anonymous U.S. official, in an expert use of doublespeak, used the Saudi violations in Yemen to justify the new arms sale. The American populace is routinely fed the line that U.S. actions in the Middle East are noble – to spread democracy – but the reality is one of propping up dictatorships that make it easier for U.S. hegemony to thrive. Question — What is the goal of this website? Why do we share different sources of information that sometimes conflicts or might even be considered disinformation? Answer — The primary goal of Stillness in the Storm is to help all people become better truth-seekers in a real-time boots-on-the-ground fashion. This is for the purpose of learning to think critically, discovering the truth from within—not just believing things blindly because it came from an “authority” or credible source. Instead of telling you what the truth is, we share information from many sources so that you can discern it for yourself. We focus on teaching you the tools to become your own authority on the truth, gaining self-mastery, sovereignty, and freedom in the process. We want each of you to become your own leaders and masters of personal discernment, and as such, all information should be vetted, analyzed and discerned at a personal level. We also encourage you to discuss your thoughts in the comments section of this site to engage in a group discernment process. See our About this blog – Contact Us page. This entry was posted in * COURT CASE INFO, * FREEDOM FIGHTERS, * INFORMATION SOURCES, * MILITARY FORCE UNITS, - ANTICHRISTS Then & Now, - CABAL'S LATEST MOVES, - CRIMES Against Humanity, - Draconian Negative Leaders, - HIDDEN ♠ CONTROLLERS, - ILLUMINATI Negative Beings, - INSANE DICTATOR MOVES, - SECRET EVIL SOCIETIES, - WARS - ON HUMANITY, AGENDA 21 ♠ EUGENICS, ♠ CLUB OF ROME ♠, ♠ NEW WORLD ORDER ♠, BUMP-OFFS - MURDERS, Death Cult PEOPLE, Death Cult RITUALS, Death Cult SACRIFICES, DEATHS OF HUMANS, DEW - WEAPONS, HUMAN SACRIFICES, HUMANS in SLAVERY, ILLUMINATI DECEPTIONS, IMMEDIATE ATTENTION, LAW ENFORCEMENT, MILITARY - WAR MOVES, MILITARY Equipment Evil, MILITARY RESOURCES, MILITARY Secret Weapon, Negative DRACO Beings, Negative REPTILIAN Beings, Nobility - NEGATIVE ELITES, POLITICAL - PUPPETS, POSITIVE vs NEGATIVE, RELIGION - MURDERS, SATANIC Cult Information, SURVIVAL INFORMATION, UNJUST FRAUD CRIMES, WAR SOLDIER MURDERS, WARS EVIL COMPANIES, WHAT IS HAPPENING ?, WORLD ♠ GANGSTERS. Bookmark the permalink.